* Mariell's magnificent couture minaudiere is 6" w x 4" h and has a 22" silver chain. 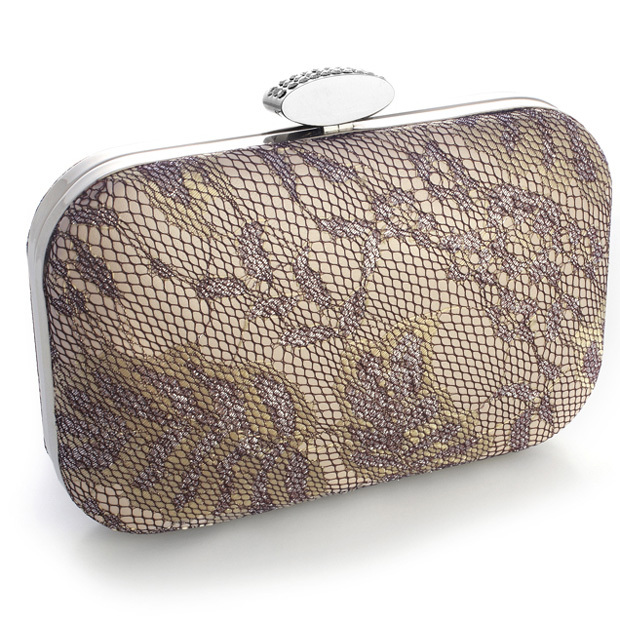 * Our silver framed purse has light champagne satin with a hint of shimmering silvery taupe and a brown lace overlay sure to be the talk of any wedding or special event. * This magnificent evening bag from Mariell is a must-have couture minaudiere for high fashion bridal stores or boutiques. * Our wholesale silver framed clutch purse has crystals on the clasp and soft champagne satin adorned with whispers of shimmery silver, gold & taupe. * It has a unique and a brown lace overlay. * This makes a great mother of the bride purse or cocktail bag.